Once again I'm back talking about my soul sister Rihanna this time focusing on her groundbreaking cosmetic line "Fenty Beauty". Like all things Rihanna touch turns into gold but this time she out did herself!! Launching 40 shades of foundations with every color on the outskirts, deep end and in between! Originally her soft launch included mainly skin products showing you her focus and core of the line. Something she has said herself "Being hands on was extremely important". When creating her foundation "Profilt'r" that has a natural matte finish and looks exactly like skin. As a makeup artist I couldn't agree more skin should always look like skin so this was a plus for me! She went even further and added highlighters, concealers/contour sticks, brushes, primer, blot sheets, blot powder and matchstixs. Leaving us with one universal lip gloss however if you purchased any of her matchstixs or highlighters leaving out eyeshadows wasn't a major factor. Most of her products were created to use wherever in my opinion she knew exactly what demographic to target. Now I did mention the word "Originally" because a month later she dropped a holiday line called "Galaxy". That focused on all things a complete beauty line would....Eyes and lips. This was smartly done because after dropping skin first and the public raving over it. Makeup lovers and Beauty Guru's were very specific in their cravings and that was MORE products! As a die hard fan of Miss Riri myself I happened to snag a few products from this highly talked about line. Profiltr Foundation 340, Killawatt Highlighter Girl Next Door/Chic Preak and Cosmic Gloss Spacesuit. Fret not I will indefinitely be purchasing EVERY product from this line! Before I give you my personal opinion let me give you my professional one first. The packaging for "Matchstixs" reminds me of "Nars Audacious Lipsticks" the way they magnetically stay together. This was something I instantly recognized you could also use them like eyeshadows. Similar to Mr. Nars "Multiples" a multi- purpose product, that a few cosmetic lines share in common. Pro Tip: Any multi-purpose product is great for the women on the go or someone who isn't into too much product and enjoys using there hands as tools. Most of her packaging is baby pink which gives it a real pro feminist feel, while others like her foundation and highlighter is white with a slight iridescent frost. Including one of her brushes down to the brush hair itself along with her precision sponge. Now I didn't get a chance to purchase the primer as of yet which happens to be at the top of my list. Most of the time I prefer not using primer but you won't get the best results if you don't have the necessary essentials. Every cosmetic line works well with products designed to compliment their items. 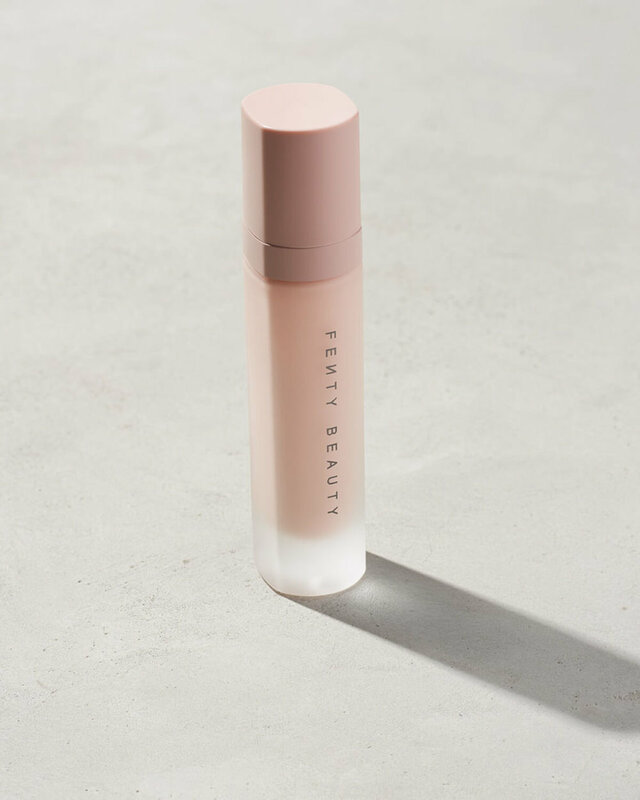 Fenty is no different so I suggest purchasing the primer. Now I've had my fair share of foundations and only two are my favorite all for different reasons. Pro Filt'R Matte Foundation reminds me of Studio Fix Fluid by Mac Cosmetics mixed with Nars All Day Luminous. The texture comes out like a water based foundation would but dries down rather quickly. Using a brush is the best way to build coverage and it slightly oxidized once I finished applying. Very similar to Studio Fix Fluid without feeling or looking heavy the finish is indeed natural. At first glance you might feel the color is off wait a few seconds. After it settles your skin truly looks even and flawless! Now normally I mix a few foundations to get my exact shade but surprisingly 340 worked perfectly. Not only did it work but I wore it outside for 8hrs and received great feedback! Didn't feel the need to apply finishing powder BUT I do think having the blotting powder would've helped with some shine threw out the day. Killawatt is undeniably highlighters you need to have in your personal and client kt! Outside of "Trophy Wife" being the star of the show every "Killawatt" highlight is so bomb I purchased "Girl Next Door & Chic Phreak" this duo knocked me off my feet. The appearance creates a soft glow but don't get it twisted you could pack this baby on and it will light the city up. They also make great eye shadow colors along with Matchstixs! Giving us that good old "Boss Lady " brown magic and making it her business to incorporate product for EVERY man or women out there. Understanding what it means to be a black women in the beauty industry, but to find a major flaw that corporations failed to acknowledge for years. Seeing what mainstream identifies with as "Pretty" while proclaiming diversity in their brand. She stepped back and viewed the entire pie as a whole not one slice! Leaving no complexion nor race feeling less then valuable and providing products that work well with different undertones. Yes we all have different views on what brands have done it before, but not at this level. Because if they did her merchandise wouldn't be sold out! So I give Fenty Beauty 10 stars for being reasonably priced and understanding the science in skin tones. For using her platform yet again to shake the industry while showing the world we have to power to determine what Beauty Means To Us..
Congratulations Rihanna keep changing the game you have my full support!